–Michael Burlingame, Abraham Lincoln: A Life (2 volumes, originally published by Johns Hopkins University Press, 2008) Unedited Manuscript by Chapter, Lincoln Studies Center, Volume 2, Chapter 35 (PDF), 3856-3857. “Lincoln’s heart went out to mothers who suffered multiple losses – women such as Sarah Mills of Des Moines, Iowa, who lost her husband, father, and brother at the battle of Corinth, Mississippi, and Polly Ray, a widow in North Carolina whose seven sons were killed in the war. 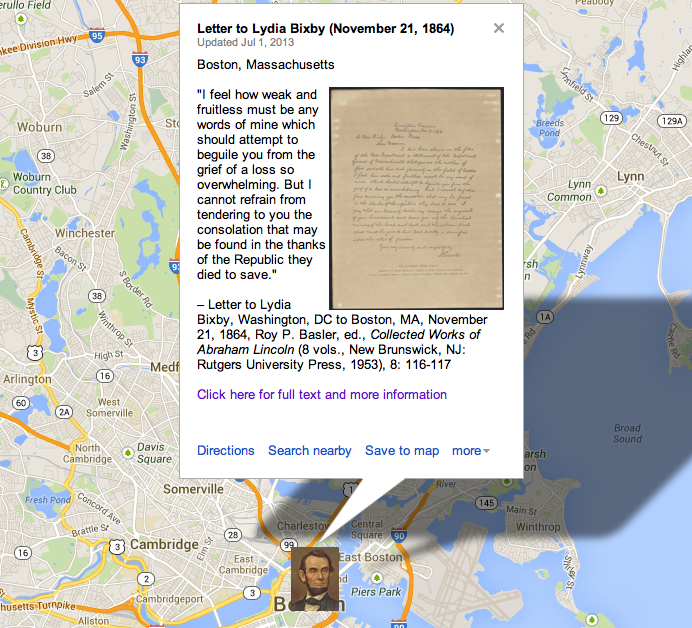 Lincoln had recently written a compassionate and masterful letter to a Massachusetts woman, Lydia Bixby, who claimed to have lost five sons in the war… Years later historians discovered that Lydia Bixby was a Southern sympathizer who ran a whorehouse and that she had lost two, nor five, sons. She did indeed have three other sons: one had deserted the army, another may have deserted, and the third was honorably discharged. Despite the mythology of her case, Lincoln’s Bixby letter is a classic example of presidential compassion from a deeply caring man who would feel the pain of those who had lost loved ones. –Donald Winkler, Lincoln’s Ladies (Nashville: Cumberland House, 2004), 192. —I have been shown in the files of the War Department a statement of the Adjutant General of Massachusetts, that you are the mother of five sons who have died gloriously on the field of battle.